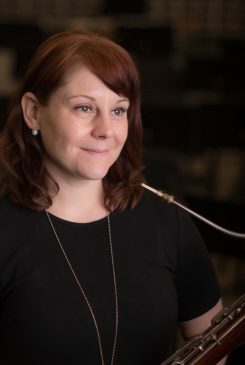 Jenny Mann is Associate Professor of Bassoon and Chamber Music Coordinator at The University of Alabama, Principal Bassoonist of the Tuscaloosa Symphony Orchestra and bassoonist of The Cavell Trio. Jenny performs actively as a soloist and chamber musician. Performances include the 2011, 2012 and 2013 IDRS Conferences, 2012 NFA Conference and the 2012, 2013, 2014 and 2015 International Clarinetfest. As a member of the Cavell Trio she released two recordings, The Art of Collective Invention (2012) and Dialog (2014), and is in the process of a third. She is the bassoon mentor at Hot Springs Music Festival and the author of the new hybrid teaching resource Teaching Woodwinds: Bassoon published by Mountain Peak Music. Jenny is also the Executive Director of the Tuscaloosa Symphony Orchestra and works actively with future arts administrators to improve their skills as well as other arts organizations to create new opportunities for collaboration. Her degrees include a BME, Baylor University (Pre-K-12 Music); MM, UT Austin; she began her DMA at the Eastman School of Music and completed it at UT Austin. Jenny is dedicated to helping students navigate their way through the changing field of music and seeks to blend high level performance, chamber music, education and music marketing skills to create successful future musicians.